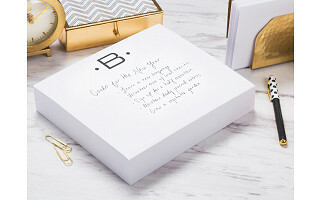 When a sheet from a notepad deftly transforms into sophisticated stationery, it’s one sharp-looking and multitasking win-win. 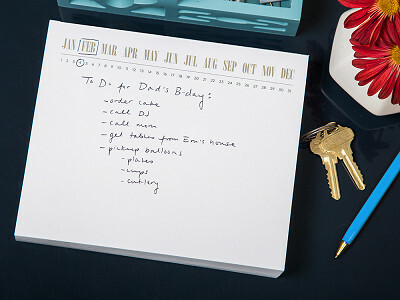 The thick notepad blocks from Black Ink pull double duty by letting you move between to-do lists and writing letters. 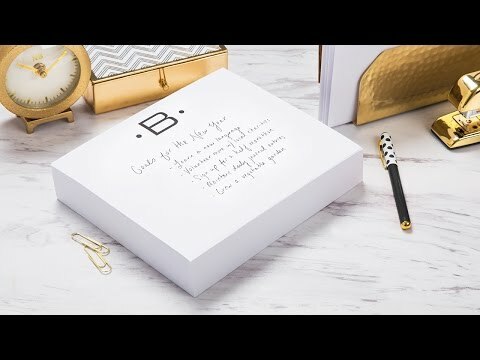 Fold a heavyweight paper page to fit into a standard business envelope, and—voila! It’s now fine stationery. 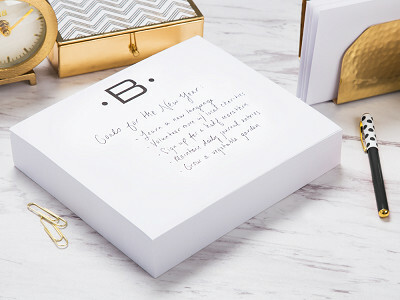 The dense, high-quality notepads are Made in the USA and showcase Founder Patti Black’s signature, classic style. 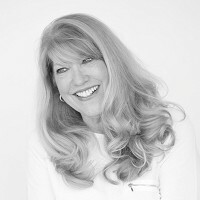 Patti has her own custom stationery boutique that specializes in weddings, so she is the right person to nail the balance between function, quality, and looking fantastic. 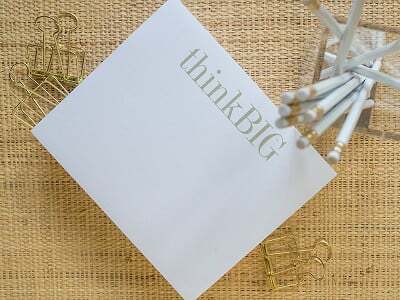 One of her notepad designs makes a perfect, ready-to-go gift, too—for teachers, hosts, or friends—that will be reached for time and time again. Hello everyone! I'm proud to introduce Black Ink products to The Grommet. I'd be happy to answer any questions you have! @Ann Thanks Ann!! For now, the intials are only in black ink (ha ha!) as I feel it is the classic..goes with all ink/pen colors and just looks good on anyones desk! Hi Patti! Good luck on your launch. A question - how does your paper handle fountain pen ink? @Frank Hi Frank..our stock is unusually THICK and luxe in feel ! It is one of the things that makes our pad stand apart from others on the market...I have not tested a fountain pen but I feel confident it would be great! I hope you buy one and try it!! What kind of fountain pen do you use?? I am a bit of a pen freak myself! Goes along with the paper addict in me! @Patti what are the dimensions of the pad? @terry Hi Terry...approximately 8x7...I know sounds too big...BUT IT IS NOT! I get calls from clients telling me they love the way that their hand fits on the surface of the pad! It is just so great...it becomes a staple that you can't live without!! Give one a try for YOU! Hi! If we send you a digital logo can you put that on instead of the initial? In black and white non-transparent, or a black and red transparent .png? Love the idea! @caliann Hi Caliann....we DO custom pad orders in our wholesale division...25 pc minimum. We can touch base with the Grommet about this! Great idea! @Patti I would be interested in the custom pad also. How do we connect to get this done? Hi Julie and Caliann, shoot an email over to [email protected] and they can help you out. I was wondering when the calendar pad will be available? @Linda Hi LInda....it is available NOW as we speak!! Order with the Grommet! @Patti I was able to order (Yay!) but sometimes when you go to the page, it says Notify When Available. You may want to contact The Grommet and let them know! I can't wait to receive my Calendar Notepad! Hi Linda, that's because we've already sold out of them. Talk about good problems. We hope you enjoy! Approximately how many sheets per pad? @KIRK Hi Kirk...275 sheets of very white, luxe paper...not your regular pad stock by a mile!!! Is there a reason why you do not offer a pad with the letter "Z" on it? @Patti Hi David...hopefully we will offer the entire alphabet soon! We did our early orders on the letters most used in the USA...all statistics...I know it's very frustrating as one of my oldest friends is a "Z" !!! Stay tuned...hopefully soon!! !